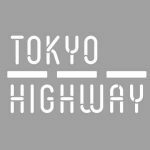 The contents of the Tokyo Highway box are pretty minimal: some grey lollipop sticks, a few round pillars, some intriguingly wonky looking blocks and so very cool coloured cars. All of the components are made of wood and feel good while playing, and despite everything other than the cars enjoying the same shade of grey, when everything is put together it looks really nice, the kind of game you’d “accidentally” leave half-played on the table when you’ve got people coming over for a couple of drinks. It’s a pretty straightforward game to play too, but one of the bigger differences between this and other building and stacking games is what happens when everything crumbles to the ground and everyone’s fine building work ends up in a pile of rubble. This, incidentally, is where we changed the rules. 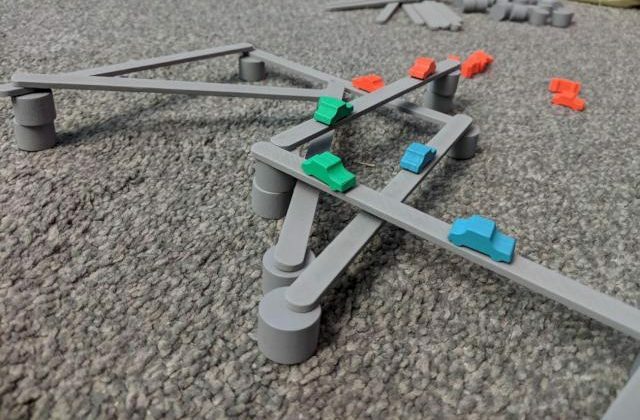 The game starts off with two simple roads, but as players take their turn by placing pillars, roads and cars the layout of Tokyo’s brand new transport system starts to take shape, turning a fledgling couple of roads into a twisting, overlapping birds nest of chaos and tricky decisions. The general idea is to get your roads to overlap those of the other players; the more roads you cross by placing your own, the more cars you position on your new stretch of highway. The trouble is, every time you overlap a couple of roads you need to try and make sure the next player can’t take advantage of some questionable positioning and overlap even more. Trying to stay out of reach while simultaneously keeping within a move of overlapping other roads is a real conundrum, giving your games a hint of Schrodinger’s Highway and requiring you to be both there and not there at the same time. Careful planning is handy, but a steady hand to position your roads and cars without sending everything flying is even more important. 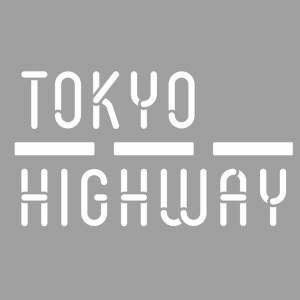 Tokyo Highway wants you, in such a situation, to rebuild the road network. Not put a few things back, rebuild the whole thing. As it was. Now, there could be dozens of pillars, cars, sticks and cars all precariously balanced before your stumbling clumsiness messed it all up, and the likelihood of getting them back the way there were is somewhere between barely and not at all. Even with Beast of Balance, which similarly asks you to get everything back up within a time scale, doesn’t care where things go, just as long as it’s all back before your time runs out. Other games call it quits when someone knocks everything over, while others just let you carry on with some mild carnage still hanging around. But having to put everything back takes ages, to the point that other players might start to get bored, or argue that things aren’t quite right. So we didn’t bother. Sometimes we left the earthquake fallout where it was, other times we ended the game with the person knocking stuff over to be the loser. We decided at the time depending on just how much of the road network was left, and it really made the game flow better. In fact, leaving everything on the ground and trying to carry on building around the chaos was interestingly challenging, and made for a very fun after-game by itself. And while part of me thinks it’s not a problem that we had to do this and make our own end-game rules up, another part of me thinks that we shouldn’t have needed to. If people stick to the rules then they’re potentially in for a frustrating ride, and with a game that has such charm and simplicity it seems a real shame. But let’s be realistic – changing a rule or two if you don’t like those in the rule book is hardly the biggest issue you’re ever going to face. With that in mind it becomes quite easy to recommend Tokyo Highway. It’s easy to learn, almost anyone can play and the clean, simple visual nature of it look great. It part stacking and balance game, part strategy, and for something neat to get out and play with friends it could be well worth your time.